Rosette leaves 5–9, ovate to elliptic, 0.6–3 cm long, 4–14 mm wide, margins crisped; petiolate. Scape to 25 cm high, with 3–5 spreading stem leaves. Flower c. 20 mm long, erect, green and white with brown towards apex of galea. Dorsal sepal with a filiform point c. 5 mm long. Petal margins not flared. Lateral sepals tightly embracing the galea; sinus flat with a shallow central notch, protruding in a shallow curve when viewed from the side; free points to 2 cm long, filiform, erect, often curved forwards at the apex. Labellum oblong-lanceolate, suddenly tapered above the middle, 8–10 mm long, c. 2.3 mm wide, the tip just visible from the sinus in the set position. Distribution and occurrence: Grows in moist, shady slopes of sclerophyll forest, south from near Orange. 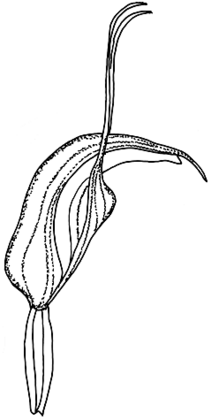 Previously included in Pterostylis alata (Labill.) Rchb.f., but that taxon now considered to be endemic to Tasmania.